UberScoreMaster offers two kinds of rapid score entry. One is intended for after match entry and the other for real-time. The after-match method assumes you are working off a score sheet for a shooter and you enter scores one stage at a time. The real-time method revolves around entering data by squad, stage and then shooter, just like you would shoot a match. Both methods are interconnected and data is saved back to a server so you can mix the two methods if you like. 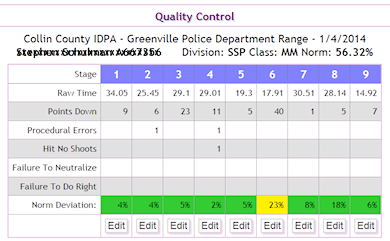 After the final stage is entered, a QC display is shown so that the MD can visually verify the results. 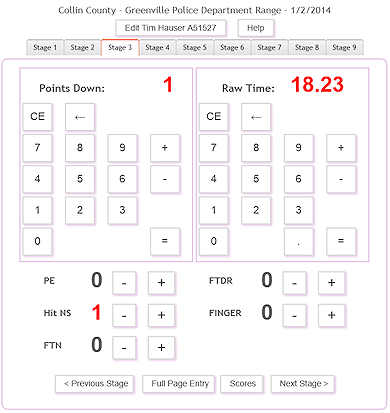 All Real-Time score entry is done using large buttons, not little keyboard buttons. You can quickly do all score entry using one hand with your thumb! Results are saved permantently and immediatly. No syncing required. There is nothing to install on your phone. Anyone with a smart phone can help enter results. Multiple people can keep score at the same time. You cannot duplicate score entries so no "cleaning of dupes". We used our years of professional experience building software apps to create a slick interface for you that simply can't be any easier to use.